Another Friday, another pick from the web. We call these Fida (Friday) Finds. Confession: we didn’t have to look very hard for this week’s Fida Find. This African-inspired cartoon project has been on our radar for a while, and first appeared on our Animated Africa Pinterest wall back in January. But the buzz around Spider Stories has grown louder since its creators John and Charles Agbaje hit their fundraising target on Kickstarter. With $30,000 raised, their production company Central City Tower can now get to work on a pilot episode. Before Spider Stories the Agbajes created Project 0, a series of graphic novels. The story took place in a beautifully realised sci-fi universe, but like most sci-fi and fantasy it had no clear links with Africa. By contrast, Spider Stories draws heavily on the brothers’ West African heritage. The main characters are a young warrior princess with a love of technology, a drummer who acts as both ‘spirit guide’ and griot, and a Spider Spirit who is based on the folk character Ananse. Character artwork for the series blends traditional dress with futuristic weapons and accessories. Drummer Ayan wears a blue and white dashiki, while President Gamba wears an agbada fronted with high-tech armour. There are others on the same road. Shrinkfish Animations has created The Legacy of Rubies, a 23-minute animation by Nigerian writer-director Ebele Okoye. Here in Ghana, Otoo Studios delivered a brilliant short cartoon based on the traditional game Chaskele, and subsequently worked with 6miludo Media on an animated music video for Jayso & Sarkodie. So while John and Charles are breaking new ground, they are doing so in good company. When the Agbajes turned to Kickstarter to get Spider Stories up and running, they took it very seriously. Their campaign gave ample proof of their commitment and artistry – see the clip above – and was kept updated with new rewards and progress reports from the brothers themselves. As a result, they beat their $25,000 target by an impressive $5,000. There’s a good lesson here for aspiring creatives: neither raw talent nor online tools guarantee success. Hard work and ‘offline’ networking have to be a part of the mix. Luckily, the Agbaje brothers seem to have the whole package. We can’t wait to see the pilot, and hope it will prove there is a huge global appetite for animated content set in Africa. A big ayekoo! (well done!) to John and Chris for taking the project this far. We plan to bring you regular highlights from our Pinterest boards, which are kept active by a team of ‘virtual volunteers’ in the USA and Ghana. We have our partners Friends of Mmofra to thank for recruiting and managing student ‘pinners’ on our behalf! 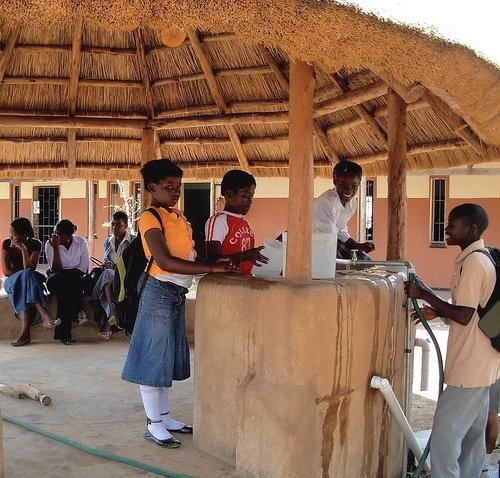 This week’s picture comes from the First Lubuto Library in Lusaka, Zambia. But as you’ve probably noticed, it isn’t a picture of the library itself. It doesn’t show shelves, books or children reading. So why have we chosen it? An insaka is a round, open-sided meeting place. According to Zambia Vernacular Architecture, the word means ‘place to gather’ in Bemba. So the picture shows that where there is a library, there will be people. Libraries can bring communities together. Inside the insaka is a tap and basin. We can tell from the faces of the children that they didn’t pose for the picture. Nobody told them to use the washbasin. It is simply part of their visit to the library. When a library becomes a community meeting place, it also becomes a platform for other things. Here it helps teach children the importance of sanitiation – not just for personal hygiene, but for protecting books that can be damaged by dirty hands. Lubuto’s full range of preservation, reading promotion, educational and social service activities are a model for the valuable role libraries can play in national development. …. The significance of publicly accessible libraries as a gathering place and safe haven cannot be underestimated. As well as establishing community libraries, the Lubuto project helps introduce Zambian kids to the children’s literature of their own country. Its staff and volunteers hunt down forgotten books in local languages, digitising them and making them available online. Could Ghana do the same? If a team of volunteers went in search of Ghanaian children’s books from previous generations, what would they find? Are there forgotten books hidden in your house? At Mmofra we’ve produced modern versions of our founder’s work for children, including an award-winning illustrated audio- and e-book of Voice in the Forest. We found this passage in a lecture given at the National Museum of Ghana in 1970. The lecturer was a Mr Ken Akatani, then director of the UN Information Centre in Accra. “Wherever I travel these days, if I can set aside a few hours I try to do two things. One is to visit the museum and the other is to see the botanical gardens. By seeing the botanical gardens, I not only enjoy and taste the beauty of the gardens themselves, but I try to sense the love the people have for their nature and the environment. We’re not sure what conclusions Mr Akatani would draw from the official gardens of Accra – Aburi, Legon or Efua Sutherland Park – today. But if they disappointed him, we hope our plans, or some of the private gardens of our supporters, would renew his faith. As for the National Museum itself, he would no doubt be encouraged to see groups like Friends of the National Museum and Adventurers in the Diaspora campaigning to keep it on the agenda of the government and the public alike. The text can be found in an original booklet of 1969 and 1970 lectures given at the museum, issued by the Ghana Museums and Monuments Board and printed by Accra Catholic Press. Among other pieces, it also contains an interesting essay on beads and a history of Ghanaian urbanism. A small number of copies are available in the museum shop at five cedis a copy – which is one more reason to pay the institution a visit. You could think of ‘upcycling’ as recycling with style. 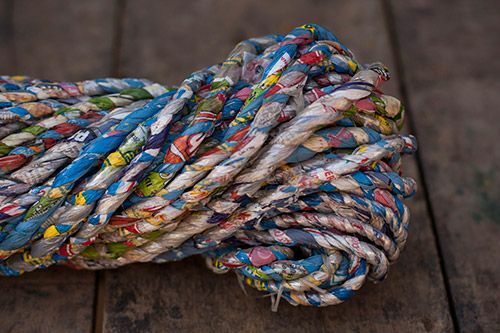 Upcycled products start out as waste, but the material isn’t just reused. It is turned into something better. Sometimes upcycling is an informal street activity, taking place in towns and cities everywhere. But there are also small and medium-sized businesses doing it, often inspired by ingenious ideas from everyday life. In Ethiopia, Sole Rebels uses old tires for the treads of its Fair Trade-certified shoes. They are made in local communities and shipped all around the world. Here in Ghana, Mmofra Foundation’s near neighbours Trashy Bags make bags, laptop cases, wallets and more out of discarded water sachets and old billboards. ‘Upcycling’ will be a key element of our Playtime in Africa project. Using scrap for seating, shade and other elements will help keep our playspace low-cost and environmentally friendly. 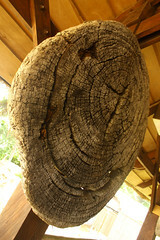 It will also help teach our visitors to think creatively about the world around them. But the benefits don’t stop there. Designs that uses cheap, readily available material are easier for other people to replicate. So if a community far away from Dzorwulu likes the look of what we’ve done, they can build their own version! This summer we’ll be focusing on reclaimed wood. There is plenty of it in Ghana, and it can be used for both practical and ornamental objects. Take a look at these bookcases made of disused canoes at a hotel in Madagascar, or these huge slices of tree trunk we spotted hanging at a beach resort in Ghana. There is sensory value in their appearance and texture, and they can also help teach curious kids what the inside of a tree looks like! 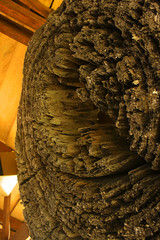 If you see any examples of recycled wood, let us know. Email us at info@mmofraghana.org, or @ us on Twitter. We’ll share it with our followers and give you a mention. Our Galimoto! wall is dedicated to homemade toys from Africa. This has to be the most high-tech one we’ve ‘pinned’ yet. The picture shows 15-year-old Nigerian teenager Odo Gerald with his range of self-built diggers, bulldozers and dumper trucks. But these aren’t just push-toys. Thanks to a sophisticated system of pipes and syringes, these miniature machines really work. As the Galimoto! gallery shows, ‘play’ is not just a break from the serious business of ‘work’. It can promote ingenuity, experimentation and independent learning. Who knows where those habits could take you? Check out our post from last year about a 15-year-old radio whizz from Sierra Leone. 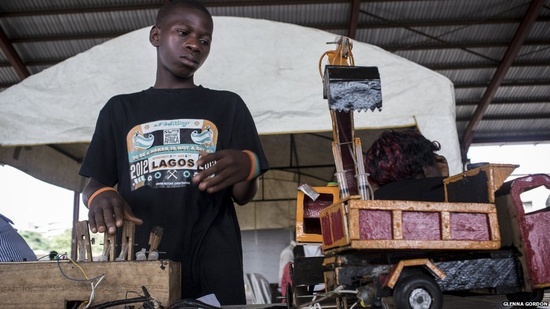 You might also remember the three Nigerian girls featured in the same post, who designed a urine-powered generator (also exhibited at Maker Faire in Lagos). Closer to home there is Mmofra Math, a math-focused computer game designed by Accra teenager Leovi Nutakor and tested by kids from our own Language Club. You’ll find some, but they are under-represented. Why? Do they play less? Do they make fewer toys? Or are boys just better at getting in front of the camera? Where are the middle-class children? As incomes rise, will hands-on toy-making be replaced with ready-made products? What effect could that have on children’s creativity? Another Friday, another special pick from the Web by our media volunteers. We call these Fida (=”Friday”) Finds. Londoner Kelvin Okafor is an artist whose reputation, to his parents’ relief, is growing by leaps and bounds. People seeing Kelvin Okafor’s drawings for the first time can be forgiven for mistaking them for photographs. Visit his website though, and you’ll learn from the artist himself that he is a Passionate penciled artist. Highly interested in detail and precision. Most of his marvelously lifelike drawings, like the one below titled “Timeless”, are in pencil and charcoal. Kelvin provides a fascinating step-by-step “evolution” of many drawings on his website. His subjects are often celebrities whose faces are instantly recognizable. At other times, he might choose to draw a friend, or a visiting family member from Nigeria with an interesting profile. Kelvin also generously shares his technique through short videos which are linked through his website. He spends 90 to 100 hours on each portrait! In this profile he talks about his inspirations and motivations. He’s also got some good tips for aspiring young artists. Aya: Life in Yop City collects the first three volumes of Marguerite Abouet and Clement Oubriere’s award-winning series of graphic novels, which follow the day-to-day life of a young woman in the Ivorian capital Abidjan. Aimed at young adults, the stories are loosely based on the author’s own childhood in the city’s Yopougon-Koute suburb – ‘Yop City’ for short. Abouet uses the books to depict ordinary human dramas, consciously avoiding the themes that dominate Western depictions of life in African countries. “The easygoing and careless [carefree?] impression of Africa that is found in Aya fortunately still exists. It would be nice if the African continent were evoked dropping the stereotypes of suffering, because Africa is really quite a large and diverse continent. Abouet’s characters fall in and out of love, argue with family members, go to work; they are average middle-class people, depicted with warmth and humour. The light tone is reflected in wonderfully detailed illustrations by Abouet’s husband Clément Oubrerie, who works from his wife’s own visual concepts. The Aya books come with an ‘Ivorian Bonus’ at the end, featuring lifestyle tips and helpful definitions. Palu is malaria, and claclos are deep-fried spiced ripe plantain dumplings (Ghanaians, take note). There’s also an illustrated recipe for chicken kedjenou and a guide to carrying a baby on the back using your pagne (brightly colored wax-printed cloth). Following a familiar pattern, the Aya comics have been more accessible outside Cote d’Ivoire, particularly in the US and in France, where Abouet now lives. Fortunately for readers in Cote d’Ivoire, the author has been able to convince her publisher to sell cheaper softcover versions there. We’d love to see the series more widely read by young adults everywhere, particularly in African countries, and so we’ve added several Aya collections to our Young Adult Booklist – one of our ‘wish lists’ of titles for our library in Accra. They also appear on our Animated Africa for Kids & Teens wall. The non-profit organisation Friends of African Village Librarives (FAVL) is also a big Aya fan. It runs community libraries in Ghana and Burkina Faso, and has been campaigning hard to get Abouet’s books onto the shelves. For rural readers in West Africa, quality books that deal with familiar themes and environments can be all too hard to find. We noticed writer Nnedi Okorafor, who is a favorite on our Young Adult wall, added the first Aya book to a literature course reading list in the US last year. Mmofra Foundation’s Pinterest page has 23 boards and counting! Our boards range from ideas for outdoor play features and African design inspirations, to intriguing topics like Animated Africa for Kids & Teens and Everything Ananse! Pinterest provides fantastic opportunities for virtual volunteering. However, pinning is not anywhere near as widespread in our part of the world. For one thing, reliable wi-fi access and bandwidth are still a problem for most people. Enter our partner organization Friends of Mmofra in Spokane, Washington State, USA, which “designs web-based opportunities to enrich cultural literacy and global connection”. In practice, this means in collaboration with us, they organize student volunteers from high school to college level, to research and create boards on topics we are interested in. Friends of Mmofra uses a model it calls parallel projects through virtual service, based on a relationship of mutual benefit rather than charity. Students in Spokane use African inspired projects to improve their global awareness as well as their technical and leadership skills. Children in Ghana, and everywhere, gain access to cultural collections they can take ownership of, and learn from. In addition to their curation interest as under-represented cultures and topics online, our Pinterest boards are very valuable tools for getting connected. They have helped us get attention in communities we’d like to talk to, and to make the Top Story listing for a number of online newspapers recently. Drew, 16, worked on the Everything Ananse board as an after-school online research project on folktale culture of West Africa, the Caribbean and the Americas. She’s also been active on our favorite Galimoto Selfmade Toys board. She says: “I would like to thank you so much for the amazing opportunity you have given me with [Friends of Mmofra]. I have learned so much and enjoyed it even more. So Thank you! And know what you are doing is truly amazing …”. Other students are helping to create boards of young adult as well as children’s books. Before this exercise, some of them may never have thought of reading a book by an African author, or thinking about the differences in young adult book themes across cultures. The added value of our collections is that they include pictures, audio and video. On the Young Adult booklist board for example, you can find the novel Powder Necklace, and also listen to author Nana Ekua Brew-Hammond read from her book. College students in a recent class on Contemporary Africa at Whitworth University, Spokane, USA, opted to curate themed boards of African stamps on their own Pinterest pages. Here’s one by “Amina” on flora and fauna in African stamps, and another by “Waceera”, on dinosaur stamps! We’re grateful to the Bino and Fino team in Nigeria for their words of encouragement on our Animated Africa board which, of course, features their wonderful work. with golden bricks of honey. This is a continuation of our celebration of poems on the London Underground, which is 150 years old this year. The South African poet Oswald Mbuyesini Mtshali, who writes in both English and Zulu, remembers his traditional childhood. He was born in Natal, South Africa, and he lived at one time in Soweto, Johannesburg. and twist your sharp cutting edges. Nii Ayikwei Parkes is from Ghana. He writes novels, poems, short stories, articles and songs. On his website, under-16’s will be directed to the Schools Site, where there is information about his poetry workshops with schools.